For those who don't know. The Bruery has an annual release of their Barrel-aged stout called Black Tuesday. There are multiple variations, but today's subject is Grey Monday which is Black Tuesday aged on hazelnuts. This was originally a one-off brew made especially for a dinner event at Beachwood BBQ, but it garnered such acclaim and attention that The Bruery decided to bring it back. Pours pitch black as expected. I can see maybe a hint of brown or ruby red on the edges when held up to the light. My aggressive pour generated less than a half-finger of fizzy, light brown head, but it disappeared almost instantly. The aroma is massive bourbon with some alcohol, but that's expected at such a high abv. Those hazelnuts are rather sweet, but it combats the booziness. As it warms it smells more like fresh hazelnut coffee with some vanilla. A nice chocolate component goes along with the hazelnuts and actually reminds me of Nutella. I've tried Black Tuesday and I can honestly say that this is significantly sweeter, but that's a good thing. The first thing I detect is sweet bourbon, but not cloying. I know this isn't aged on cacao nibs like some of the other BT variants, but I am tasting a rather heavy chocolate flavor. Those hazelnuts are doing a great job at holding the beer back from being overly sweet as their nutty and roasty aroma and taste are bringing a zen-like balance to what could have easily been sweet, boozy mess. I also get some slight wood from the barrel, and even some fresh cream, vanilla, and marshmallow. There is some alcohol on the taste, but at 18.25%, it is barely worth noting as it's just a minor, passing phase. It actually helps move this big beer along, so it's actually welcome in this case. The mouthfeel is thick and viscous just like a giant, barrel aged stout should be. I mentioned before that the head was fizzy and this translates to the feel as I pick up carbonation bubbles. That combined with the minor alcohol sting push this giant beer along the palate. The finish does leave a warmth in my chest and it feels a little sticky on the aftertaste. That being said, for such a big, complex beer, it drinks ridiculously easy and while there is a sting to it, this goes down smoothly for nealry 20.00% abv. 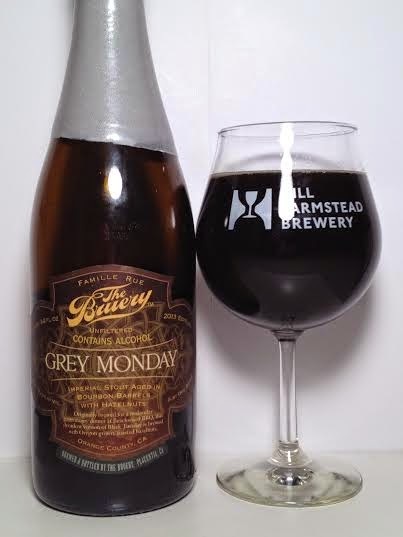 Given The Bruery's reputation for big, boozy beers, Grey Monday has not been difficult to put down at all. Granted, this is a high abv sipper for sure, but the warmth of the booze combined with the sweet bourbon that is balanced out by huge chocolate and roasted hazelnuts make this not only a complex brew, but just plain delicious and fun. The hazelnuts prevent this from being too sweet or boozy, which makes their addition to Black Tuesday arguably the perfect match. If you were slightly turned off by Black Tuesday because of the alcohol and sweetness, this you have to give Grey Monday a try as the hazelnuts have neutralized any unpleasantness that may have come from the base beer. Hey there, thanks for the review! Just wanted to give you a heads up that Patrick is heading to Boston next week. We just posted the details on FB: https://www.facebook.com/events/367008416833872/367008420167205/ Enjoy!